In the fifteen years following the Second World War over 3 million people emigrated from the German Democratic Republic (East Germany) to Federal Republic of Germany (West Germany). At a meeting in 1961 Nikita Khrushchev suggested to John F. Kennedy that NATO forces should withdraw from West Berlin. 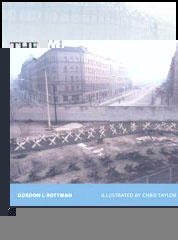 Kennedy refused and in August 1961, Erich Honecker ordered the blocking off East Berlin from West Berlin by means of barbed wire and antitank obstacles. Streets were torn up, and barricades of paving stones were erected. People living in East Berlin and the German Democratic Republic were no longer allowed to enter West Berlin. This included 60,000 people who had working in the city. The wall was 166 km long cut through 192 streets, 97 of them leading to East Berlin and 95 into East Germany. Over the next few months construction workers began replacing the provisional barriers by a solid wall. A new wall was built in 1965. This consisted of concrete slabs between steel girder and concrete posts with a concrete sewage pipe on top of the Wall. The Berlin Wall was heavily guarded and around hundred people were killed and many more were seriously wounded trying to cross the wall. The last person to be killed was Chris Gueffroy on the 2nd June, 1989. With the collapse of communism in 1989 the Berlin Wall was removed and the two German republics were united. Up to August 13, 1961 the East Berliners were half-free. They had of course, to work during the day in state-owned enterprises in an unfree society and were subject to an arbitrary legal system. But in the evening at the close of work, they came over to West Berlin to meet relatives and acquaintances, go to the movies or the theatre, stroll up the Kurfiirstendamm, read Western newspapers. About eight million theater and movie tickets were sold each year in West Berlin to East Berliners. About 60,000 people from the East came daily to West Berlin to work in factories and workshops.... For 13 years people could move fairly freely in both parts of the city and meet whenever they wished. Some 200,000 Germans from East Berlin and the Soviet Zone visited West Berlin every day. Berlin, despite political division, was still a special area. In the autumn of 1989, precipitate developments in the 'socialist part' of Europe radically changed the situation - the Communists lost power in the first free elections in Poland and Hungary, Erich Honecker was forced to step down, and the Berlin Wall collapsed virtually overnight. It goes without saying that the events in Hungary and Czechoslovakia and later in Romania and Bulgaria caused us great concern. However, not once did we contemplate the possibility of going back on the fundamental principles of the new political thinking - freedom of choice and non-interference in other countries' domestic affairs. In our conversations, Kohl had repeatedly said that Honecker did not understand or accept Soviet perestroika and was set on implementing his own dogmatic, hard line. I had the impression that Kohl was trying to win me as an ally in case he decided himself to influence developments in East Germany. Be that as it may, I made it quite clear that we would not dictate to the East German leaders how they should run their affairs at home. Obviously, we were not blind; we had our own views on Honecker's policies and were worried about the developments in the German Democratic Republic. We did not sit idly by - but I reject any insinuation that our contact with the East German leadership at this critical moment amounted to pressure or blackmail. I had met Honecker on some seven or eight occasions since 1985 and had formed quite a consistent view of him as a person and as a politician. My cautious attempts to convince him not to delay the necessary reforms to the country and the Party had led to no practical results whatever. It was as if I had been speaking to a brick wall. We last met in October 1989.1 had gone to participate in the ceremonies planned for the fortieth anniversary of the German Democratic Republic. Honecker had pressed me to come. Despite some hesitation on my part, I agreed to attend.